This phrase came to my attention when I was training to be an NCT antenatal teacher in 1990. Pregnant women expecting their first baby in Norfolk and Suffolk who choose to attend antenatal classes with About Birth & Babies may find this phrase is still in use, as we help them prepare for the reality of labour and birth in hospital. 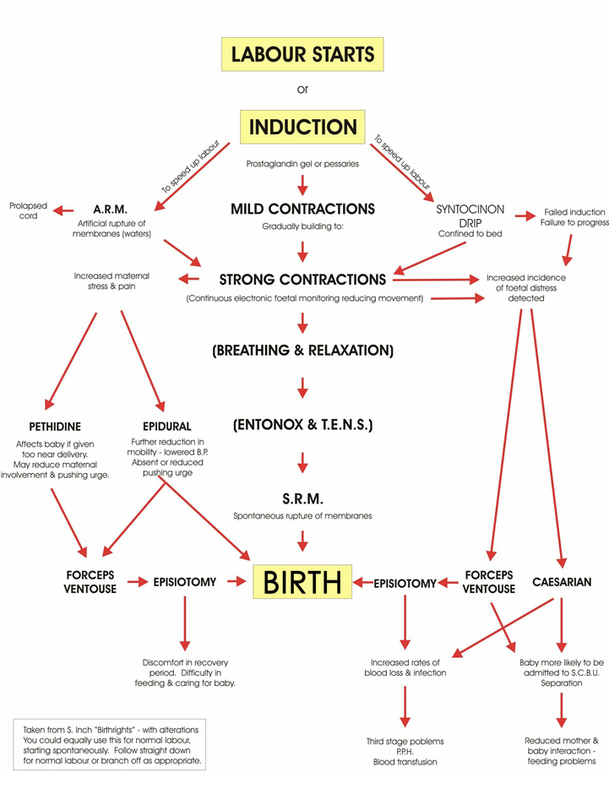 I first saw the cascade represented as a diagram (or flow chart) in a book written by a midwife, mother and breastfeeding counsellor, “Birthrights” (Inch, 1982). I decided straight away that it was a useful way of showing how labour can progress down many different pathways - and I came up with my own adaptation which I have used in my classes ever since. I understood it to mean the process by which intervening in a woman’s labour in one way, may lead to further interventions becoming necessary. My cascade can be used to illustrate a straightforward labour and birth, or a complicated one involving one or more interventions. It also allows us to see how a seemingly innocent intervention such as ARM (artificial rupture of membranes or breaking the waters) may lead to suddenly stronger contractions, which may in turn increase the mother’s need for pain relief and/or make the baby distressed. We know from many studies that continuous electronic foetal monitoring (cefm) increases the need for assisted and caesarean births. 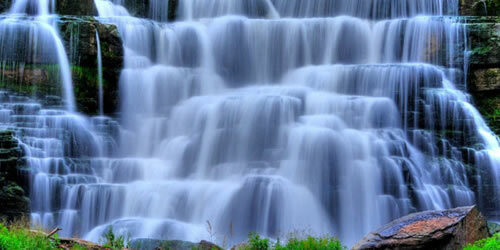 Cefm is used more often when women accept induction, augmentation, epidural and other interventions on the Cascade. See Sarah Wickham’s article on use of technology in birth here. Human beings can rationalise this decision if their belief is that being in hospital is safer for birth, and the introduction of the more home like Midwifery Led Birth Units (MLBU) has helped with making the transition easier, the Birthplace Study showed us that choosing home or MLBU will still substantially improve a woman’s chances of having a straightforward birth without interventions – even if she is transferred. Birth place decision support. It would be nice to think that in 2019 the phrase “Cascade of Intervention” is an historical one. Sadly not, a large percentage of women who go into hospital healthy and considered at low risk of needing help still experience multiple interventions. Induction rates have soared in the last 10 years, much of this increase due to concerns about babies’ growth. “. . . they had been really concerned with growth and size charts and scans predicting him above the 90th centile. They kept measuring me/him as too big for gestational age and wanted to induce, but happily when we went to be examined he must have known it was the right time because it turned out I was already 3cm dilated so we could do things naturally as we’d hoped.” (Hollie, mother of Porter, born November 2018 weighing 7 lbs 9 oz). 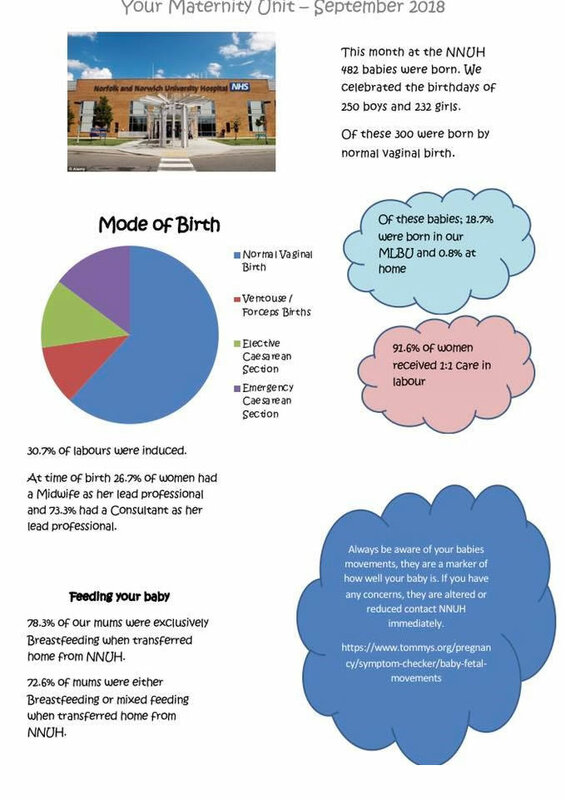 Based on the results of the Birthplace Study and other research we believe that 80% of “low risk” women could proceed to labour and give birth without any assistance if they chose midwifery care at home or in an MLBU. The reality is that 50% or less of those who choose to give birth in an obstetric unit will have a “normal” birth. Home birth safe birth. “We had been advised against our wish for a home birth due to concerns with shoulder dystocia, but luckily as we’d had no intervention we were able to use the MLBU and that was a fantastic home from home - thanks to your advice we knew we could still advocate for the birth plan we wanted.” (Hollie again). As Antenatal Educators we have a dilemma. Presenting evidence based information to parents expecting their first baby sometimes conflicts with what they are being advised by their health care providers. After 29 years in this job I am no closer to finding a solution to this. All we can do is to continue to support women in their choices, make sure they know they can make informed decisions, listen to their stories at the reunion, and be glad when they feel at peace with whatever their experience was, because they felt informed.